Markt Schwaben is a city with a population of just 12000 people. It lies east of Munich, with excellent connections via freeway or tram in just 20 minutes to the city centre. Just 10 walking minutes away from the train station, in a detached non-smoking house where 2 guest rooms are available to rent. Whether you‘re hoping to visit the Munich Convention Centre, Munich Oktoberfest or spend a day in the city, you can reach them all in just 20-30 minutes by public transport or with your own car. Ample parking spaces are also available here, so going to the Convention Centre, football stadium, city or airport will be no problem. Diverse shopping as well as various restaurants and beer gardens are located nearby. 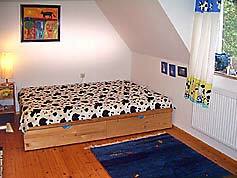 Both guest rooms are located on Martin-Luther-Str. in 85570 Markt Schwaben near Munich, Germany. One of the guest rooms is on the 1st floor, is sunny and inviting, with a double bed (140 x 200 cm) and wooden flooring. In the other guest room on the floor below, you’ll be sleeping underneath the stars as part of the ceiling is made out of glass. 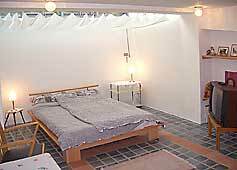 This large room has underfloor heating, a TV, double bed (140 x 200 cm), is sunny and friendly with a terracotta floor. Smoking in the house is not permitted, but is allowed in the garden or on the terrace. 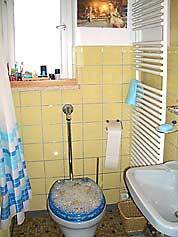 The bathroom with toilet is for the sole use of the guests. Use of the living room / kitchen is gladly shared with the host. Wifi is available. Pets are welcome, as long as they are well behaved and trained. The host speaks German, English, French, Spanish, Russian and Czech. If you stay only one night: extra charge of 10 euro per room. Breakfast can be offered at a surcharge. Please arrange this with the host before arrival. An extra fold up bed or mattress can be supplied. For your booking a deposit of at least 25% (for Oktoberfest 50%) is necessary, 100% payment on arrival applies only to last minute bookings. 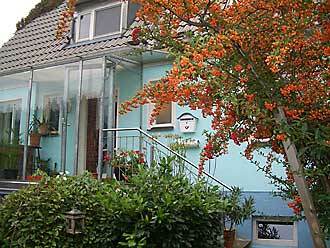 Minimum stay 2 Nights during Oktoberfest and important conventions, on weekends during Oktoberfest 3 nights. We highly recommend using the well developed and quickly growing tram and subway, better known as the MVV (Münchner Verkehrs- und Tarifverbund) to get around. The present situation on the access roads can be rather frustrating and time consuming. The MVV has some good offers, for e.g. group tickets (5 people) for just 16 Euros or a 3 day ticket for one adult for 29,50 Euro, as well as reductions for over 30 tourist attractions in Munich and its surroundings. These tickets enable stress free travel to any point in the city! Munich city center 20 minutes: The city train line 2, whose station is nearby, stops every 20 minutes and takes you to the city centre in less than 20 minutes. Munich Convention Centre in just 15 minutes: You would need double as long with a car, especially during peak times and would still need to pay exorbitant parking prices, if you are even lucky enough to find a parking space. Oktoberfest / Theresienwiese 42 minutes: By city train number 2 to Ostbahnhof München, than undergound no 5 to Theresienwiese. You can park your car easily on the street and for free. 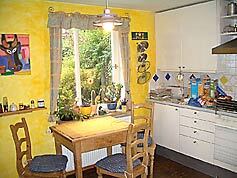 The guest rooms are made available by Privatzimmer Sens, Agency for holiday apartments and guest rooms in Germany.